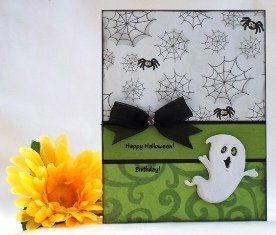 Find unique homemade card ideas to make a Halloween birthday card. 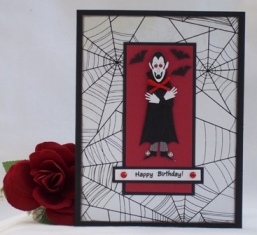 Making birthday Halloween cards can be fun using vampire accents and cool paper. Halloween birthday greeting cards are fun to make because there are lots of Halloween accents to choose from. 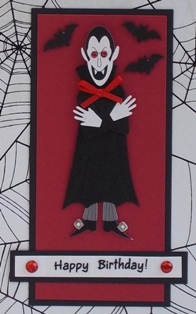 For my handmade card making project, I featured a dracula sticker. The pack of stickers I bought had small bats so I included them for my Halloween card idea. Make Halloween cards using ideas from other cards you've made or a sketch. My idea for this Halloween card craft was from an ebook I purchased called 50 Card Making Sketches. I used sketch #47 but I altered it a bit. I think paper the author uses is a bit outdated but if you use more modern paper, your card will look great. The sketch includes instructions on how to build your own Halloween cards like mine but adjust your card if you have different size embellishments as I did. When you are using this sketch to make Halloween birthday cards, adjust your paper size to allow for the sentiment on the bottom. You can make a lot of unique Halloween cards with so many sketches from 50 Card Making Sketches. For this Halloween card making project, I started with a blank, black card. Sometimes, when you make a Halloween card with a card already cut and scored, it helps save time. I like using chalk ink on my homemade Halloween cards because black chalk ink helps create a soft border around light colored paper. I applied black chalk ink around the spider web paper and then placed it over my black card. 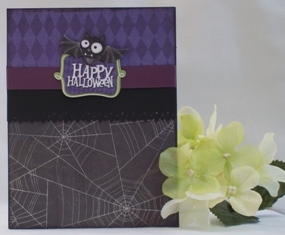 After choosing your featured sticker or embellishment for your paper card making ideas, position it over colored paper and allow for a sentiment to be placed on the bottom of the colored paper as I did for my handmade Halloween card. You can stamp or use stickers for your Halloween greeting card. 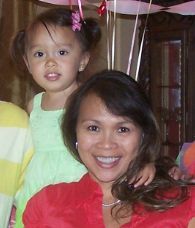 I happen to print mine on clear laser labels. I then adhered it to white, cardstock paper and then taped it over a small black piece of paper. 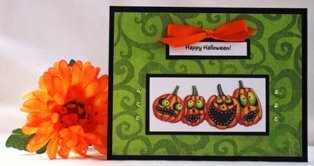 Don't forget embellishments for your Halloween card ideas. Use ribbons or adhesive gems like I did on my card. I placed gems on my card to help anchor the sentiment. You can come up with so many unique Halloween cards for birthdays. Halloween card designs can be simple or complicated but whatever you make will sure be appreciated. 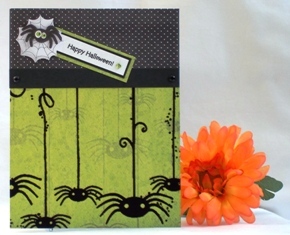 Here are other cardmaking ideas to build your own Halloween card. 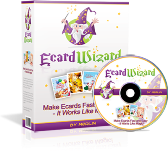 These are great designs for making Halloween birthday cards as well.